"Maharani" redirects here. For the music album, see Maharani (album). For the 1957 film, see Maharani (film). "Maharaj" redirects here. For the Indian best-selling author, see Rabi Maharaj. For other uses, see Maharaja (disambiguation). Durbar of Pudukkottai Maharaja with British officials. Mahārāja (Sanskrit: महाराज, also spelled maharajah) is a Sanskrit title for a "great ruler", "great king" or "high king". The female equivalent, Maharani (or Maharanee, Mahārājñī), denotes either the wife of a Maharaja or Maharana, and also in states where that was customary, a woman ruling in her own right the equivalent title was Maharani. The widow of a Maharaja is known as a Rajmata "queen mother". The form Maharaj indicates a separation of noble and religious offices, although the fact that in Hindi the suffix -a is silent makes the two titles near homophones. The word Maharaja originates in Sanskrit and is a compound karmadhāraya term from mahānt- "great" and rājan "ruler, king"). It has the Latin cognates magnum "great" and rex "king". Due to Sanskrit's major influence on the vocabulary of most languages in Greater India, the term maharaja is common to many modern languages of India such as Kannada, Tamil, Hindi, Marathi, Rajasthani, Malvi, Telugu, Odia, Punjabi, Bengali and Gujarati. The Sanskrit title maharaja was originally used only for rulers who ruled a considerably large region with minor tributary rulers under them. Since the mediaeval times, the title was used even by rulers of smaller states since they claimed to be the descendants of the ancient maharajas. The Maratha Maharaja Sayajirao Gaekwad III of Baroda. Maharaja Nripendra Narayan of Koch dynasty. 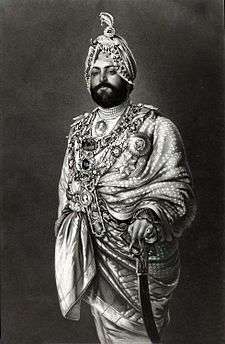 Maharaja Duleep Singh, the last Maharaja of the Sikh Empire. Maharaja Jaswant Singh II of Marwar, c. 1880. Attributed to Narsingh. The Brooklyn Museum. On the eve of independence in 1947, India (including present day Pakistan & Bangladesh) contained more than 600 princely states, each with its own ruler, often styled Raja or Rana or Thakur (if the ruler were Hindu) or Nawab (if he were Muslim), with a host of less current titles as well. The British directly ruled two thirds of India; the rest was under indirect rule by the above-mentioned princes under the considerable influence of British representatives, such as Residents, at their courts. The word Maharaja may be understood simply to mean "ruler" or "king", in spite of its literal translation as "great king". This was because only a handful of the states were truly powerful and wealthy enough for their rulers to be considered 'great' monarchs; the remaining were minor princely states, sometimes little more than towns or groups of villages. The word, however, can also mean emperor in contemporary Indian usage. The title of Maharaja was not as common before the gradual British colonisation of India, upon and after which many Rajas and otherwise styled Hindu rulers were elevated to Maharajas, regardless of the fact that scores of these new Maharajas ruled small states, sometimes for some reason unrelated to the eminence of the state, for example support in World War I or World War II. Two Rajas who became Maharajas in the twentieth century were the Maharaja of Cochin and the legendary Maharaja Jagatjit Singh of Kapurthala. Variations of this title include the following, each combining Maha- "great" with an alternative form of Raja 'king', so all meaning 'Great King': Maharana (as in Udaipur), Maharawal (as in Dungarpur/Jaisalmer), Maharawat (Pratapgarh), Maharao (as in Kotah, Bundi) and Maharaol (as in Baria). Maharajah has taken on new spellings due to time change and migration. It has even been shortened to Mahraj and Maraj but the most common is Maharajah and Maharaj. Despite its literal meaning, unlike many other titles meaning Great King, neither Maharaja nor Rajadhiraja ('King of Kings'), nor even its equivalent amongst Maharajas, 'Maharajadhiraja', ever reached the standing required for imperial rank, as each was soon the object of title inflation. Instead, the only Hindu title which is commonly rendered as Emperor is Samraat or Samraj(a), a personal distinction achieved by a few rulers of ancient dynasties such as the Mauryas and Guptas; the Muslim equivalent of emperor would be Padshah, applied to the Mughal dynasty. Dharma-maharaja was the devout title (compare Rajadharma) of the rulers of the Ganga dynasty. Maharajadhiraja Bahadur (or Maharajadhiraj Bahadur): Great Prince over Princes, a title of honour, one degree higher than Maharajadhiraja. Maharajadhiraja (or Maharajadhiraj): Great Prince over Princes, a title of honour, one degree higher than Sawai Maharaja Bahadur. Sawai Maharaja: a title of honour one degree higher than Maharaja Bahadur. Maharaja Bahadur: a title of honour, one degree higher than Maharaja. Maharaj Babu: A Rajput princely title.Used as ruling title of Hazari Estate of South Chittagong. Certain Hindu dynasties even came to use a unique style, including a term which as such is not of princely rank, e.g. Maharaja Gaikwar of Baroda, Maharaja Scindia of Gwalior, Maharaja Holkar of Indore, three of the very highest ranking ruling Maratha houses. Like Raja and various other titles, Maharaja was repeatedly awarded to notables without a princely state, such as zamindars. One Raja of Lambagraon, a Jagir (in Himachal Pradesh) who served in the colonial army was granted personally the non-hereditary title of Maharaja of Kangra-Lambagraon and a personal 11-guns salute, so neither honour passed on to his son and heir. In the major, Muslim realm of Hyderabad & Berar, there was a system of ennobling titles for the Nizam's courtiers, conferring a specific rank without any (e)state of their own, not unlike peerage titles without an actual fief in the UK, the highest titles for Hindu nobles being Maharaja Bahadur and Maharaja, above Vant, Raja Rai-i-Rayan Bahadur, Raja Rai Bahadur, Raja Bahadur, Raja and (the lowest) Rai; for their Muslim counterparts there were alternative titles, the highest being Jah and Umara; e.g. the Diwan (Prime Minister) Maharaja Sir Kishen Pershad, held such a Maharaja-title. Maharaj Kumar (or Maharajkumar) means son of a Maharaja or Heir-Apparent; the female equivalent is Maharaj Kumari (Maharajkumari): daughter of a Maharaja. 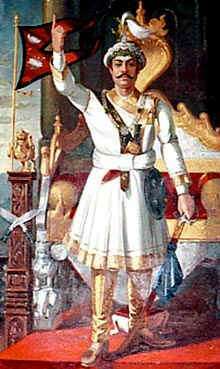 The Kings of Nepal use the title of Maharajadhiraja (or Maharajadhiraj) which was Great Kings over Kings, a title of honour, a degree higher than Maharaja. 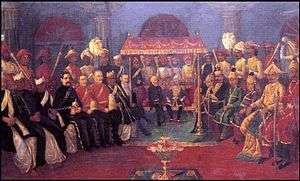 Rana Prime ministers of Nepal used the title of Maharaja. 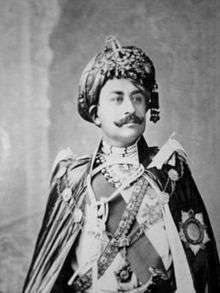 Sri Panch Bada Maharaja Dhiraj Prithvi Narayan Shah Dev of Nepal. As many Indonesian states started out when the archipelago was still predominantly Hindu (Bali still is) or Buddhist, some have been ruled by a maharaja, such as Srivijaya, Majapahit and Kutai Karta Negara (until that kingdom converted to Islam in 1565, when the Muslim title of sultan was adopted). Traditional titles remain in use for the other members of this dynasty, such as Pangeran Ratu for the heir. The Englishman Capt. James Brooke was declared as Raja Brooke by the Brunei Sultan. 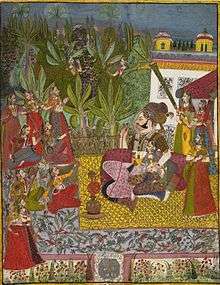 The word Raja derived from the word Maharaja. Raja Brooke, who was married to a Sarawak woman, pacified the Sarawak Revolt against the Brunei Sultan. Thus declared by the latter as Raja during the Raffles' stint. Maharaja was the title of the monarch of the peninsular Malay state of Johor(e) from 1873 to 1885. The Arabic, Muslim title sultan, often considered of higher rank, was re-adopted later and remains in current usage. The title Bendahara Seri Maharaja was used by the ruler of Pahang (1623– 1853 in personal union with Johor, eventually becoming a fief of the Bendahara family), till on 6 August 1882 Tuanku Ahmad al-Muadzam Shah ibni al-Marhum Tun Ali adopted the title sultan. In northern Borneo, the title Maharajah of Sabah and Rajah of Gaya and Sandakan was used from 29 December 1877 to 26 August 1881 by Alfred Dent (compare White Rajah). In contemporary Malay usage, the title Maharaja refers to an emperor, e.g. "Maharaja Jepun" ("Japanese Emperor/Emperor of Japan"). In Seri Malayas of the Srivijaya, under the Srivijaya satellite empire of the Majapahit Empire dominated over the whole Malayas far reaching the present Philippine Archipelago, Malaysia, Brunei, Indonesia under the Srivijaya Empire of the Majapahit King Maharaja Pamariwasa. The latter's daughter Es-kander was married to an Arab (Zein Ul-abidin) who was a Srivijaya ruler in Seri who were a Srivijaya Monarchy. In the 12th century with the fall of the empire, the Seri King being a Muslim established the Sultanate of Brunei in 1363 with the reigning title as Sultan Mohamad Shah. In 1426, as his death was recorded in 1431 Mt. Makatangis Sulu grave and 1432 Brunei grave as Sulu and Brunei claims the honour of his grave, he also did established the Sultanate of Sulu while his brother Makdum Karim (Sharif Kabungsuwan of Malabang Lanao), a Srivijaya Johore ruler who later established the Sultanate of Maguindanao-Ranao (Mindanao) after taking the political authority of his father in-law Tomaoi Aliwya of the Maguiindanao family dynasty. A progeny in 1704, Sayyid Nakhoda Perkasa Angging (Maharaja Anddin) grandson of the second Brunei Sultan Ahmad, the former married to Mahandon the sister of Muwalil Wasit (the 1825 Sulu Sultan Jamaulul Kiram-I), The latter who begoted the 1839 Sulu Sultan Pulalun. Being childless, Pulalun proclaimed his Crown Prince- Maharaja Adinda Taup (son of Sayyid Nakhoda Perkasa Angging). The title Maharaja Adinda at the beginning of the name to append Sultan. Maharaja Adinda Taup the 1859 Maharaja of the Sulu Sultanate and Prince Heir-apparent of Sultan Pulalun at the time. Sulu Sultan Jamalul Kiram-I (Muwalil Wasit) was the 70 year later descendant of the 1752 three So called Sultans of Mindanao, namely; Kiram Sinsuat, Kiram Misuari and Kiram Sorronga. The latters in 1752, whereby Mindanao was ceded in inheritance to them by their consanguinity-Kinship, the Noble King Luisung Tagean-Tallano. And Maharaja Adinda Taup's son was the 1916 Sharif Imam Ul-Alam Arpa and Highest Spiritual Leader of the Sulu's, the latter whom American Gov. Frank W. Carpenter returned Sulu's sovereignty as a suzerainty. The Sharif Promulgating the Literacy Campaign, building of roads, schools, water system and Jambatans-Wharfs as supported by the said American Governor, the latter named the said Sharif's son as Carpenter Arpa-I placing five silver dollars on the child's chest symbolic of the five Sulu Sultanate territories. Sayyid Paduka Ahmad Carpenter Arpa-V is the Monarchical Chieftain of Maharlika Mindanao and Sulu, as by the facts and proprietary rights as by the 2007 agreement between the Philippine Government and the Prince Julian Morden Tallano, the progeny of King Luisung Tagean Tallano. In the Philippines, more specifically in Sulu, maharaja (also spelled "Maharajah") was a title given to various sub-divisional princes after the fall of the Srivijaya of the Majapahit Empire. Parts of the Philippines may have later been ruled by community leaders as maharajah from once being under the Srivijaya and Majapahit empires. In the establishment of the Sultanate of Sulu from approximately 1425 to 1450, the title of maharaja was even used by a Sulu sultan, such as the 1520–1548 Sulu Sultan Maharaja Upo (Sultan Shar ul-uddin Digmin, also known as Mu'izz Ul-mutawad'in). Maharaja Lela was the title of the ruler of the State of Naning (founded 1641), until it was annexed by the UK to Malacca in 1832. Most famous was Bendahara Seri Maharaja Tun Mutahir of Malacca (executed 1509) and Datuk Maharaja Lela Pandak Lam of Perak (executed 1876). The palace marshal of the Yang di-Pertuan Agong (head of state) of modern Malaysia is called Datuk Maharaja Lela Penghulu Istana Negara. In the Sulu Sultanate in the Philippines, the Raja Muda (Crown Prince) is the heir to the throne, the Maharaja Adinda is the second heir apparent and the Maharaja Lailah acts as chief of the palace. Eventually, Maharajah Adinda was also used to refer to a particular lineage within the royal families. Maharaja was also part of the titles of the nobility in the Sumatran sultanate of Aceh. In the past the title of Maharaja is given to leader of the unreigning noble family and the Prime Minister Maharaja Mangkubumi. The last Prime Minister of Aceh who was installed to be the Maharaja Mangkubumi, Habib Abdurrahman el Zahir, also acted as the foreign affairs minister of Aceh but was deposed and exiled to Jeddah by the colonial Dutch East Indies authorities in October 1878. 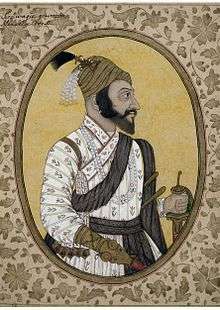 The name Maharaja may also append one as a successor Sultan. ↑ "Entry of the Sultanate of Sulu in the Almanach de Bruxelles."